Duende, aka CTW Duende, is a 8-year-old red female born May 27, 2008. Her sire is Dodgem By Design and her dam is CTW Outa Sight. Duende has 120 races on record at various tracks from 2009 to 2012. She went on to whelp a litter of puppies in 2014. 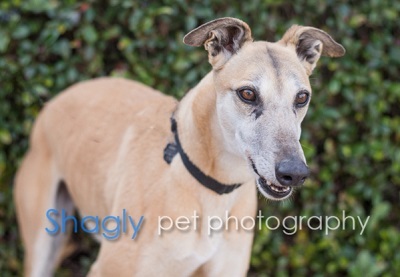 This loving girl will soon be looking for her forever home! Duende is not cat or small dog tolerant at this time. Duende is a people-pleasing pup! She loves to be in sight of her humans, whether indoors or out, and will come up for attention. Her coat is soft, just waiting to be petted and to be told she's a good girl. One of my favorite things is to call Duende when she's outside, so I can watch her bound up the steps to the deck. She leaps over 3 steps and lands once on the landing, once on the deck - grace in motion. Who knew that an old gal could be so athletic?!? 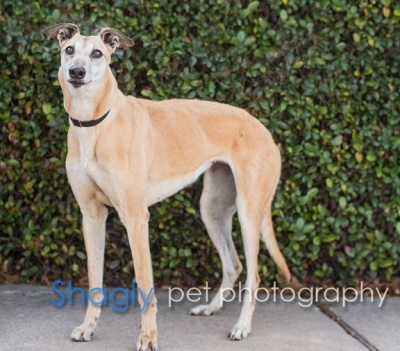 Duende is the queen of the roach – all she needs a soft bed, some attention, and you'll be guaranteed a friend!